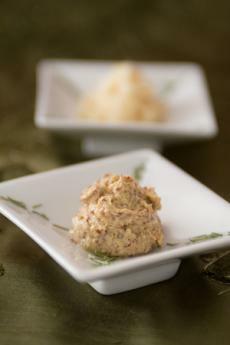 Stone-ground mustard with horseradish: one of the stars of the line. Photography by Saidi Granados. America’s specialty food stores are packed with gourmet condiments. Yet, as good as we would like them all to be, different brands vary in the degree of excitement they present to the demanding palate. That’s why it’s especially rewarding to discover a line that should be on the shelves everywhere: True Natural Taste Organic White Mustard. The Honey Mustard alone is the best we’ve ever tasted, and proves that you can find sophistication and layers of flavor in a product that is generally pleasant, with a one-dimensional sweetness. The rest of the mustards are so well crafted, you can taste the quality of the ingredients (where can we buy apple cider vinegar that’s this good?). Here is an artisan at work, preparing small batches of mustard with the very best ingredients available. You’ll know it the minute you taste it, and may start eating the mustard from a spoon (as we’ve enjoyed doing over the past few weeks). There’s also an organic Atomic Horseradish, marrying horseradish root with parsnip to create a very different and earthier, more flavorful style than the prepared horseradish in the refrigerator case (or our grandmother’s own eye-opening recipe of horseradish and beets). The line is certified kosher and (like all mustard) is gluten free. Mustard is a terrific condiment. Low calorie, no fat or sugar (no cholesterol, no carbs), it has a spate of health benefits that are discussed in the main review. When you find a line this good, it’s worth clearing the shelf of your current inventory and trading up to a truly terrific taste. The Dijon flavor won the “best organic mustard” gold medal at this year’s Napa Valley Mustard Festival; but read about our favorites in the full review on TheNibble.com.